With the perpetrators of the attack on the Boston marathon now apparently identified as brothers from Chechnya, and with one of those brothers still at large terrorizing Boston, it's worth noting that before the bizarre turn of events that led to this morning's chaotic scene, Internet detectives made one last totally shameful false accusation that also in this case involved the harassment of a family currently desperately searching for their lost son and brother. Yesterday, a Reddit user posted a new, startlingly clear image of the aftermath of the explosion, that shows, on the far left, what looks very much like one of the FBI's suspects fleeing the scene. After Philip Bump, an Atlantic Wire writer and Photoshop expert, explained why he believed the image was genuine the New York Times confirmed the photo's authenticity. So: The Internet actually found a new, much clearer photo of one of the FBI's suspects. Amazing! It could've taken ages, before the Internet, for this evidence to surface and be sent to law enforcement. Immediately after the Internet did this admirable thing, of course, it took it to a dark and irresponsible place. Remember how thousands of Reddit users and 4chan people spent the days after the bombing combing through every available photo and frame of video of the site of the bombings, searching for the perpetrators, and they found a bunch of guys with backpacks -- so many guys they made a spreadsheet! -- and (inadvertently) allowed the New York Post to identify, on the front page, two innocent people as the bombers? And remember how when the FBI released images of the actual suspects, neither of them had been spotted by Reddit or 4Chan or any other online sleuth? Well, armed with this new, clearer photo, and giddy from having uncovered it, the message board investigative geniuses then determined that "suspect two" was a missing college student. Sunil Tripathi is a Brown University student from Pennsylvania who has been missing since March 16. On that day, surveillance cameras picked him up leaving his Providence, R.I., apartment. He left behind his computer, wallet and phone. He hasn't been seen since. Authorities also say he left behind "a vague note." The Brown student paper says he was depressed and the note suggested a suicidal intent. On Reddit, the Tripathi speculation, first limited to a branch of the conversation in the discussion of the FBI's photos and videos, soon received its own, massive thread. The thread is full of the worst of crowd-sourced message board investigations, from ridiculous total certainty ("The facial structure is almost exactly the same") to incredibly irresponsible mistakes ("Except that isn't Sunil, it's his brother"). One of the thread's first posts shows a bit of self-awareness -- "Reddit has already failed spectacularly trying to identify the suspects" -- and then concludes, "I dont think people are wrong to wonder about this. If they want to do it in some corner of the internet that's fine." The entire case was based on vague physical resemblance in low-quality photos, bolstered by the fact that one Twitter user claiming to have gone to school with Tripathi said she thought it looked like him. There were dissenting voices in the thread. Tripathi is 6 feet tall. "Suspect two" didn't look that tall. The suspect's hair was too long. And most important, the behavior made no sense. Who disappears -- causing a well-publicized region-wide search that had already expanded beyond Providence to Boston -- a month before carrying out a terrorist attack? Wouldn't it be smarter to act normal as long as possible, and maybe not do something that gets your picture posted all over television and the Internet before you attempt to plant a bomb in an incredibly public venue? Not that people who bomb innocent civilians are always the most rational actors, but they do generally try to avoid calling attention to themselves before they bomb innocent civilians. It scarcely mattered at that point. The speculation was out there. Various conservative blogs picked it up. Tripathi's name was suddenly all over Twitter. Collages of the bomber and Tripathi were shared everywhere. Everyone, as usual, put much more work into finding supporting evidence than debunking evidence. The New York Post probably already had a story written before last night's shootout and chase. Sunil Tripathi is still missing. He did not bomb the Boston Marathon. Reddit and everyone else who ran with the theory that he did effectively did to Tripathi what the Post did to Salah Eddin Barhoum. Only they did it while Tripathi's family wonders if he's even still alive. The truth was revealed before the false accusation spread too far, but the damage is done. At some point last night, after the page was filled with abuse and accusations, the Facebook group "Help Us Find Sunil Tripathi" was deleted by his family. A tremendous and painful amount of attention has been cast on our beloved Sunil Tripathi in the past twelve hours. We have known unequivocally all along that neither individual suspected as responsible for the Boston Marathon bombings was Sunil. We are grateful to all of you who have followed us on Facebook, Twitter, and Reddit—supporting us over the recent hours. Now more than ever our greatest strength comes from your enduring support. We thank all of you who have reached out to our family and ask that you continue to raise awareness and to help us find our gentle, loving, and thoughtful Sunil. If you've seen Tripathi or if you have information about his whereabouts, call the Providence Police at (401) 641-8691. 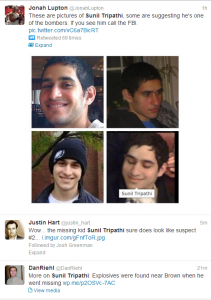 UPDATE 2: I should also note that well after Reddit and various (mostly conservative) blogs and Twitter users made and publicized this false connection, Tripathi's name was heard on Boston police scanners, which led to the identification receiving attention in the professional press, though mostly British outlets. UPDATE 3: Late last night/early this morning, after the police scanner misidentification, when just about everyone else on Twitter was doing so, Salon's Twitter account also named Tripathi as the possible suspect. I wasn't aware of that when I wrote this post. The Salon Twitter post was deleted.